My name is Rachel Cohen and I’m a junior Energy and Environmental Policy major at the University of Delaware. At UD, I’m involved in the Blue Hen Leadership Program, a four tiered leadership program aiming to build students’ leadership skills and encourage opportunities to engage in community service. It was through BHLP that I was able to get to know junior Public Health major Jaime Renman when she led a group of my peers and myself on a spring break trip to Baltimore, Maryland. The trip was focused on urban hunger and revitalization. We spent the week volunteering our time preparing urban farms for growth, working with nonprofits that aimed to rejuvenate the city, and walking the streets of inner city Baltimore giving brown-bagged lunches to homeless folks. Getting to know Jaime during this trip exposed her dedication to service and her passion for public health. These traits continue to guide her as she leads the University of Delaware chapter of the Food Recovery Network. E-board members Erika Opena, Jaime Renman, and Robin Norko volunteering at the chapter’s 2016 food drive, where the chapter rounded up 98 pounds of food. This year, they surpassed their goal of 100 pounds by collecting 205 pounds! Lucky for Jaime, the answer sort of fell into her lap. Her resident assistant from freshman year was the vice president and a founding member of FRN at UD, and all but two of the executive board members were set to graduate at the end of the year. Jaime went on a recovery and said to herself, “I don’t really know a lot about FRN, but it seems like a cool initiative and a leadership position to continue service about food insecurity which I’m passionate about.” She became the president her sophomore year and describes the process of taking on the position as being initially quite difficult. There wasn’t a smooth transition in leadership, and Jaime didn’t know where to begin with an e-board that was mostly new to food recovery and her own minimal knowledge about leading a group. 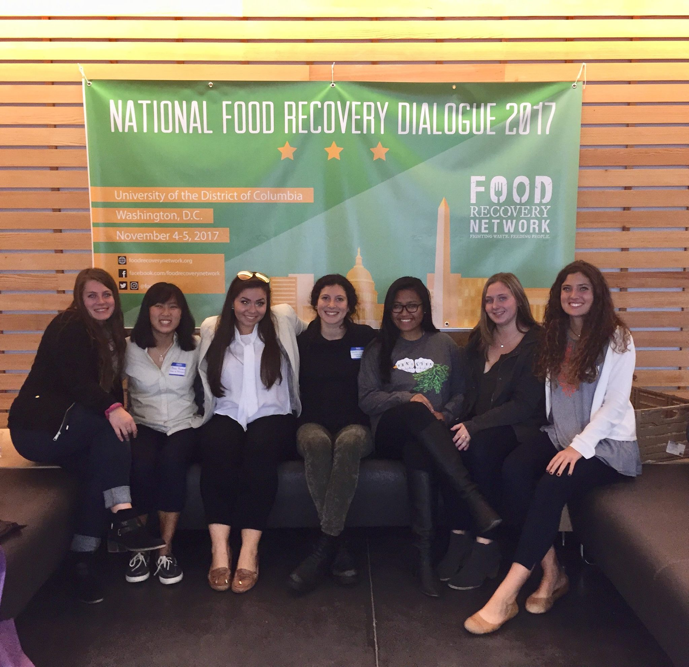 FRN at UD attended the National Food Recovery Dialogue and came back to campus energized, motivated, and inspired with new ways to help spread the mission of FRN. 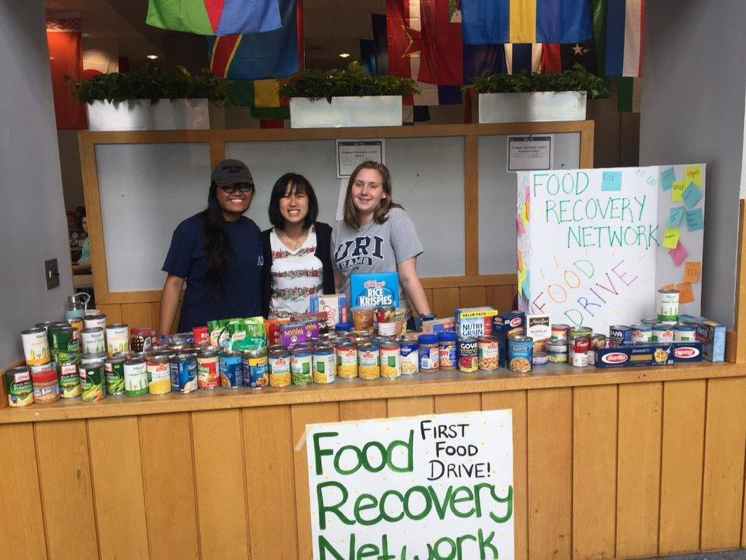 FRN at UD currently recovers food from one of three dining halls on campus. Twice a week, an e-board member and 2 volunteers load the already packaged, frozen food into soft coolers for a representative from the Food Bank of Delaware to pick up. One of the students submits the pounds of food recovered and other data to FRN National. Although they are recovering less food than in past semesters, the UD chapter maintains relationships with other hunger-fighting nonprofits by informing them that the donations will be back once they recruit more volunteers and have the capacity to recover more frequently. The FRN Chapter held a food drive in Fall 2017 and surpassed their goal by accumulating 205 pounds of non perishables. In order to say, “we still care about you and we still want to donate to you” as Jaime eagerly puts it, they delivered all the food they recovered from the drive to these nonprofits. The UD chapter is working on reaching out to local restaurants to recover more food. Jaime and Jaclyn Romano, the VP of Restaurant Donations, have begun fostering relationships to start recovering food from local restaurants in the near future. Jaclyn is the point of contact between FRN and local restaurants, seeking to foster relationships to increase food donations. She says that her biggest challenge with the position was “the fear of being brushed off by restaurants” due to anxiety that she would sound insecure and awkward when going to speak to restaurant managers. “Jaime,” Jaclyn says, “was my biggest motivator. I was losing motivation, and Jaime pushed me. We went together to talk to managers of restaurants.” Jaclyn’s perspective transformed. “I realized how awesome of an idea people think FRN is. Every manager I spoke to was so passionate for the idea and didn’t hesitate to want to be involved.” Jaclyn can’t wait to see the club initiating more recoveries in Spring 2018. 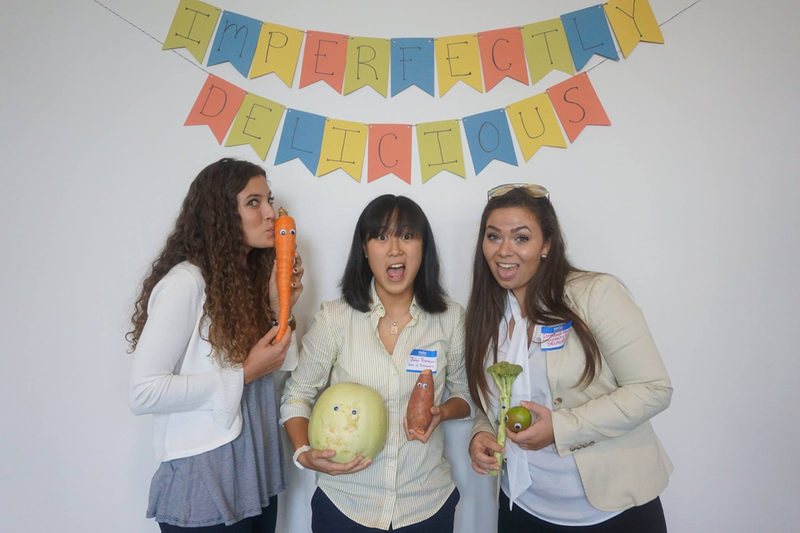 E-board members Macy Oteri, Jaime Renman, and Izzy Aswad pose with produce that is rejected due to its imperfections at the NFRD conference. In efforts to increase membership, the e-board members first began speaking to classrooms about FRN, the mission, and how to join the movement. Their member turnout at meetings significantly increased as a result. Jaclyn says their meetings began with just the e-board, “to now having a genuine group of people that are really interested and want to be involved.” They’ve formed committees, made up of a few students led by a member of the e-board, who work to find more donation sources, more hunger-fighting nonprofits to receive food, and other ways to promote food waste education. Other techniques to increase awareness and membership include handing out facts about food waste with a piece of candy in the student centers and asking food waste trivia questions to passersby to engage the community in a quick and fun way. Jaime has even had dreams about the future success of the UD FRN chapter. “I think there are really good things coming. I have to stay motivated and we have to keep motivating each other and keep building the movement,” she says.